PEARBLOSSOM – A 29-year-old Lancaster man and his teenage accomplice were arrested Sunday afternoon for allegedly robbing a local marijuana dispensary using replica handguns, authorities said. On Sunday, February 16, 2014 at approximately 5:45 PM, a Los Angeles County Sheriff’s security officer, assigned to the Department’s Parks Bureau, was on duty in his Sheriff’s Department security vehicle and in the area of Pearblossom Highway and 126th Street East, Pearblossom. The officer was alerted by a good Samaritan to a robbery in progress at a nearby marijuana dispensary, located in the 12500 block of Pearblossom Highway. The officer saw two suspects running from the location towards his direction with handguns. The armed security officer ordered both to stop and drop their weapons. A 16-year-old female, juvenile subject, and her male adult companion immediately complied by dropping their weapons and lying on the ground. As deputies from the Palmdale Sheriff’s Station were responding to the area, several residents assisted the security officer in detaining and apprehending the duo. The juvenile subject and adult suspect had allegedly robbed and threatened patrons and employees at gunpoint before fleeing the business with a substantial amount of currency. 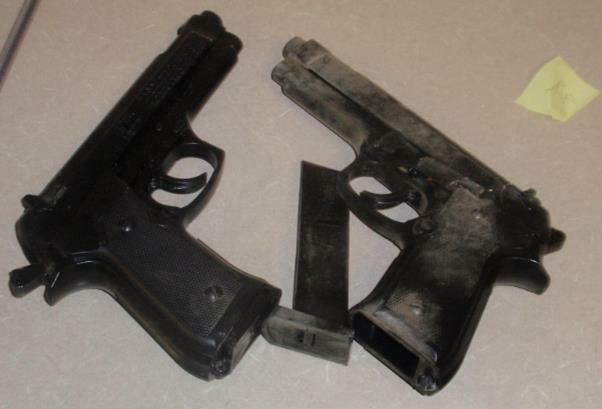 Deputies were able to recover $937, in addition to two handguns, which turned out to be very real-looking replicas of 9mm caliber Berettas. The two also had duct tape in their possession and also attempted to steal marijuana, but dropped it while leaving the business. The juvenile subject is being held without bail at the Los Angeles County Probation Department’s Barry J. Nidorf Juvenile Hall, Sylmar. The adult suspect, Warren Phillips, of Lancaster was booked at Palmdale Sheriff’s Station and is being held in lieu of $100,000 bail. The case is being investigated by the Palmdale Sheriff’s Station Detective Bureau. 1 comment for "2 arrested in pot shop robbery"
Heck yeah!!!! Thats what they get. Insta karma baby!!!. Teaches them right!!!! They will think next time they try to steal from good people that try to heal others!!!!. Just shows you how stupid amd desperate people can be. Thats going to be a funny story to tell the inmates in jail when they are laughing at how stupid your plan was.. its people like them that give dispensaries bad names. I hope the judge gives them what they deserve!! Such rotten people..